A year ago, Equity Mutual Funds were flourishing. Equity oriented mutual funds reported a net inflow of over Rs 15,390 cr. in January 2018. However, a year later, net inflows into the category tallied at just Rs 6,158 cr. Balanced Funds too, reported an outflow for the first time in 5 years. Is the sentiment towards equity mutual funds changing? We take a look. 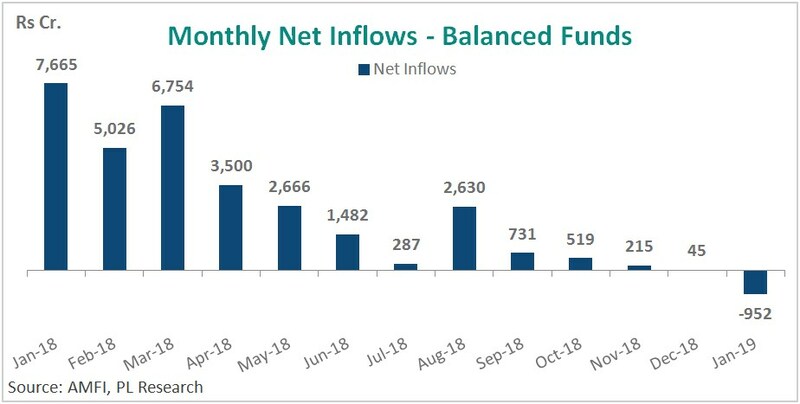 After enjoying a steady rise in inflows upto October 2018, the net inflows into Equity Mutual Funds dropped 33% to Rs 8,414 crore for November 2018, from Rs 12,622 crore in October 2018-an 8-month high. Since then, inflows have gradually declined. Equity Funds, including ELSS, reported a net inflow of Rs 6,158 cr. in January 2019. On the positive side, inflows through Systematic Investment Plans (SIPs) remain unaffected and are currently hovering near the Rs 8,000 cr. mark. Balanced funds reported a net outflow for the first time in nearly 5 years. Net inflows into the category have been steadily declining over the past few months. While sales increased M-o-M, higher redemptions led to an outflow of Rs 952 cr. in January 2019. A cause for concern for the industry is that the gross sales of equity funds fell by Rs 9,352 cr. or 32% MoM to Rs 15,614 crore in Nov-18, from Rs 22,805 crore in Oct-18. This is the lowest sales number report since January 2017. Though sales have picked up over the past couple of months, it remains below the average sales of around Rs 20,000 cr. in the previous months. Higher redemption of around Rs 11,000 cr. over the past couple of months, added to the pressure on net inflows. 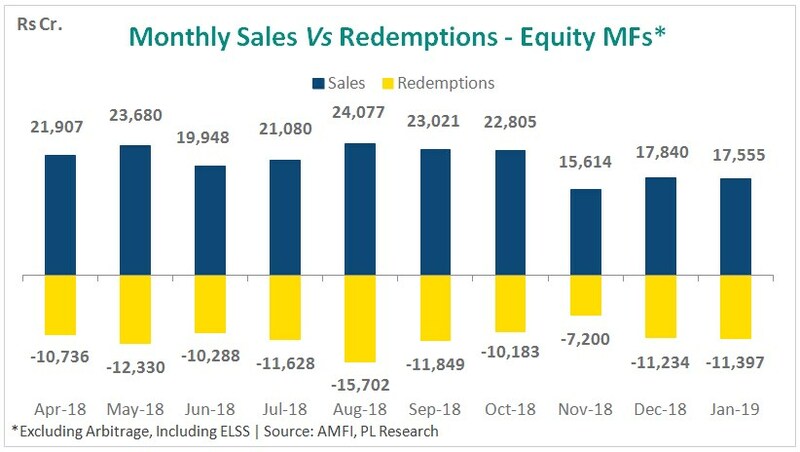 What Could Be The Reason Behind The Sharp Fall In Equity MF Sales? The volatile markets over the past few months, and the negative returns on one-year SIPs in equity mutual funds, may have reduced investor appetite for equity. While large cap fund remain in positive territory over the past year, equity MF schemes, which took an exposure to mid cap and small cap stocks, have lost nearly 25%-30% over the same period. SEBI’s ban on upfront commissions could be another key reason behind the fall in sales. The era of upfront commissions was brought to an end by SEBI last month. The reduced incentive to sell may translate into lower inflows for equity funds in the coming months. This combined with weak market sentiment, does not bode well for inflows into equity funds. As an investor, you should remain focused on your financial goals and keep investing as per your plan. Stopping SIPs or withdrawing investments now will be an imprudent approach. Keep a long-term focus. SIPs over 5 years have generated a annualized yield of over 12% on an average. To know more about the right mutual funds, do get in touch with us on WMS@plindia.com. You can check with us on our latest recommendations or send us your portfolios for a free -no obligation review!